This used to be for sale in my Etsy shop, but since I've refined my brand, I've taken it down and decided to put the pattern up here instead. It's a smallish bag, made to fasten onto a dorm bed and help replace a night table. I keep my watch, my contact case, and some cough drops in mine; I don't know what I'd do without it sometimes! This pattern has a band on the back, and a crochet strawberry flower as a button, so that it can be fastened onto things. x(st) y: x is the number of stitches to make in the next stitch. (st) is the kind of stitch to make. y tells you how many stitches to do. hdc 7 means "one hdc in each of next 7". 2sc 4 means "two sc in each of next 4". 2-x: make two stitches in first stitch, then one stitch in each of next x stitches. Repeat around. (used for increasing) If this row doesn't specify the stitch kind, use the last kind of stitch specified. 2-x dec: make (st)2tog in first two stitches, then one stitch in each of next x stitches. Repeat around. (used for decreasing) If this row doesn't specify the stitch kind, use the last kind of stitch specified. ea: Do this for each stitch around. *instructions* - Repeat from * to * around. Unless specified otherwise, join with sl st at the end of each round, then ch2. Do not turn. End off red. Join green. With green, ch however many you want to make the drawstring your desired length. I find that about 65 works. Join green. Stuff the strawberry. 8: 2-1 dec (4). fasten off with ~6" tail. Sew shut. 2: sc in each until seven from the end. ch3, skip 3 sc. sc 4. 3: hdc 4, 3hdc in chsp, hdc ea to end. fasten off. With white, mc 5 sc. Each petal should be made in 1 st.
2: *(sl st, sc, hdc, dc, hdc)* fasten off. 2. Use the yellow to sew the flower to the bag. The yellow makes the center of the flower. 3. 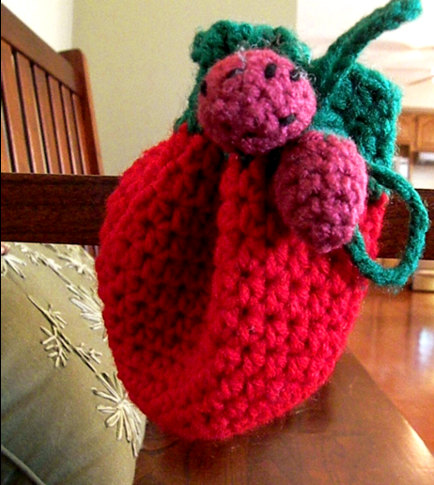 Sew one small strawberry to the end of the drawstring. Thread the strawberry-less end through the holes, then sew the other strawberry on. 4. Weave in all ends.